Artichoke tea can be a real sensation for all of you who are looking for a tasty and healthy drink. In fact, it has long been known that this plant was used in the diet, which was confirmed by the Egyptian drawings over 2,500 years ago. On the other hand, the ancient Greeks and Romans used it as a natural aphrodisiac, and today it is taken for the same purpose. But that is only a fraction of what this vegetable can be used for. It is very tasty, and will certainly often be part of your diet. Most interesting to you is a hot drink made from these wonderful plants. Therefore, below find out how efficient is good tea from artichokes for weight loss, and what benefits it gives for health. The plant Artichoke Latin name Cynara scolymus represents a long-standing culture that today mostly grows in the Mediterranean zone. It favours warm weather, and therefore cannot survive where temperatures are below freezing. In order to succeed in artichoke cultivation conditions must be suitable, and the planting is done in a similar way as with the asparagus. It should be planted at a distance of 80 cm to 1 meter from each other and in the early spring, the best mid-March. Each plant will give 5-6 large flowers, and a dozen smaller ones. These will become edible and very beneficial to your health. The period when they occur is during April and May. We recommend that you pluck it in that period. Namely, if during the summer you provide it with enough water and moisture, this plant will give fruit in early autumn. For growing artichokes use organic fertilizer, the best manure and compost. It is very important to ensure that the plant has enough sunlight throughout the day, but avoid sheltered places and shade. One month after planting, you must dig around it to remove weeds. Harvesting of artichoke is done only when the inflorescences (heads) are closed, and you can do it by hand or with scissors. Pack them into the appropriate boxes, and it is very useful to cover them with plastic foil. As far as storage goes, you can keep them up to a month at a temperature of about 0 ° C. If you want to use them after a few days, it is enough to keep them at 2-4 degrees, or in the refrigerator. There is no reason why you would not prepare tea from artichokes, because it is very effective against a number of diseases. You will love it for its taste, but you can drink it twice a day to receive necessary amounts of nutrients, vitamins and minerals. If you are wondering why is artichoke tea good, here are some health benefits. This plant can reasonably be considered a super food in every sense of the word. It is rich in phytonutrients that are essentially powerful antioxidants. They were numerous analyses that have shown that the artichoke is an excellent source of substances that are successfully fighting the toxins, and is better than any other plant! People who are tormented by high levels of fat in the blood can finally breathe easily, because there is a natural solution to their problem. 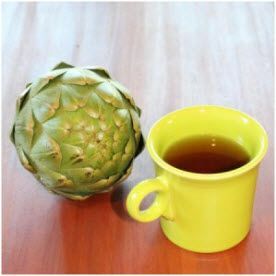 In a period of six weeks, using artichoke tea against cholesterol will reduce LDL significantly. In this way, you can protect the health of the heart, blood vessels and avoid infarction and atherosclerosis. The plant artichoke on average, contains about 12 percent of the recommended daily doses of the vitamin K. It is very important for your brain, because it protects neurons from damage and degeneration. In this way it will help you in maintaining cognitive abilities, and most importantly, will keep you from diseases such as dementia and Alzheimer's disease. In addition to lowering cholesterol, it has a positive effect on the liver by reducing the levels of lipids in the body. The best for this problem is tincture of artichokes used since ancient times. It contains phytonutrients, cynarin and silymarin which have a strong activity against fat. To use the best out of this product, simply dissolve ten drops in a glass of water and drink twice a day. In addition to being rich with antioxidants, it is basically an excellent guardian of your body when it comes to cancer prevention. The secret lies in routine, quercetin and galanin acid that effectively attacks cancer cells and inhibits their growth and further expansion. It is especially good against prostate cancer, but this is an excellent choice for men who care about their health. Foods rich in potassium, such as bananas, Jerusalem artichokes, potatoes or artichokes help to maintain electrolyte balance in the body. This mineral in addition to magnesium is essential to neutralize the sodium, which results in high blood pressure. This is precisely why this plant is recommended for those who are bothered by hypertension and water retention in the body, because in this way they will preserve the health of the heart and significantly reduce the risk of a stroke. This plant contains about 107 micrograms of folic acid, which is a quarter of its recommended daily dose. This is very important for men but also for women. In fact, in ancient times it was used as a kind of natural aphrodisiac because it increases fertility in both sexes. In addition, it is considered that eating artichokes guarantees pregnancy. During the period of nine months, it will protect nerves of embryos and enable its proper development. After all, folic acid is very important for the lactating women which is why it is recommended to drink artichoke tea once or twice a day. We have already mentioned vitamin K, which is beneficial for your brain, but artichoke as a remedy for bones is also very useful. It helps with the formation and regeneration of bone tissue. With the help of vitamin C, it will provide the necessary amounts of collagen, thanks to which your bones, tendons or muscles become stronger. In this way, it will protect you from osteoporosis and be of great help during recovery from possible fractures and injuries. Antioxidants which are rich in artichoke plant have positive effect on the internal organs, but their presence is easily detectable on the skin. Simply, the elimination of free radicals will help in solving the unpleasant phenomenon such as acne, pimples, irritation, redness, rashes and blackheads. If you are tortured by these problems, you can consume this plant, but also use artichoke drops that will replace the tonic. Every evening wash skin with neutral soap and apply this liquid with gentle strokes. Another useful and interesting facts about this plant is that it contains manganese. This mineral plays an important role in strengthening the metabolism, eliminating cholesterol, as well as the proper distribution of amino acids in the body. This is of great help to people who want to lose weight and you will learn more about it after we introduce all the ways of making the beverage out of this plant. If you want to know how to prepare the artichoke tea, you need to know that is a very simple and easy process. First of all, all you need to get is a few heads of these plants and some water. There are three ways you can make this drink. Take one artichoke, wash it well under running water and clean it from all possible contaminants. Then mash it well, using a fork or any other appropriate object from the kitchen. Then put them in a 4 ml of water and leave it to boil. It is best to stand on the stove for about 20 minutes. After that, squeeze the obtained artichoke tea through a strainer and let it to cool a little. Sweeten with honey if you are a fan of his taste. If your choice is artichoke tea, preparing larger amounts is done using 100 grams of the plant. It is necessary to clean them under water, and then remove all of their parts. Put it in 1 litre of water and leave it to cook. When it boils, remove the pot from the stove and allow it ten minutes to cool slightly. After that, simply squeeze the artichoke tea and pour it in a glass bottle, after which you can drink it two to three times a day. This is the easiest way to prepare this beverage. Choose 15 spoons of leaves of the plant and just boil them in 4 ml of water. After that strain it and drink it twice a day sweetened with honey or not, and enjoy the pleasant taste of this healthy beverage. In addition to these methods, artichoke tea can be purchased in the form of tea bags. It is prepared in exactly the same way as any other hot drink. Only pour a cup of boiling water over it and drink, if necessary, at least twice a day. First of all, it is necessary to say that this vegetable is a natural and effective diuretic. It contains vitamins, minerals and herbal supplements that have a beneficial effect on the bacteria in the bowels and the entire digestive system. Leaves of artichokes can help prevent water retention, which directly stimulates the reduction of body weight. There are indications that the consumption of this drink helps you lose 5 to 10 kilograms in just ten days. Of course, to achieve such results, it is necessary to harmonize and change your diet. For starters, throw away sweets, pastries, white flour, alcohol and junk food. This is the basis which will help you lose weight with the help of tea. In addition to this drink, artichoke capsules are excellent which eliminate bloating and gas in the stomach. In essence, this vegetable is rich in plant fibre, more precisely you have them in proportion of 10.3 grams. This represents 40 percent of the daily needs of the human body, which means that it is a great ally to help regulate digestion. Above all, it creates a feeling of fullness in the stomach, which will help you avoid unnecessary eating and you will not have sudden hunger pangs. However, you need to stop getting carried away with the thought that the artichoke tea for slimming is a magic potion that will work overnight. In addition to a healthy diet, you need to be physically active, and we recommend aerobic exercise, running, regular walking and cycling. When it comes to artichoke tea, experiences related to weight loss are very positive. Thus we learn that in addition to tea, the users used drops and tinctures, which are also drunk dissolved in water. By using these products, not only will you solve the problem of excess weight, but eliminate numerous health risks. I had big problems with triglycerides and cholesterol, which is the result of excess body weight. I was looking for the best solution, but I did not want to use those products that are advertised on television. I heard that the artichoke for slimming is very good, so I bought it at the market, and then I bought drops. The levels of fat in the blood reduced after a week, and I continue to use it still, so I lost 6kg! Artichoke capsules were of great help for me, because I was not able to solve the excess weight that I gained during pregnancy. I can say that I was delighted with their effect because they helped me lose 10 kilograms in less than a month. In addition, I regularly used them and at the same time I solved the problem of excess abdominal skin. These vegetables in addition to being healthy, are also very tasty. From it you can make a variety of dishes that will be full of healthy and beneficial substances and minerals. We suggest that you try the following recipes. In saucepan put two tablespoons of butter and leave it to melt. Then, insert a full teaspoon of cayenne pepper and finely chopped garlic. Add the flour, Parmesan cheese, if desired, and leaves of spinach and mix everything together. When the cheese is slightly melted, add 300ml of milk and stir for several minutes. Then remove from heat until slightly cooled and thickened. Shape the dough into a pizza and pour the sauce from the pan and stack the sheets of artichoke. It is necessary to bake this dish at 220 degrees for just ten minutes. Then allow it to cool and serve it. a tablespoon of vegeta spice and pepper. Clean the artichokes under running water and remove the outer leaves that are hard. Cut off the stems and sharp peaks and then soak them in lemon juice to prevent them from going black. Cut them in half and heat in butter for 15 minutes, occasionally adding water. Add Vegeta and pepper to taste. Wash the rice and pour it into the pan, stir well and pour the white wine. The water may be replenished until all ingredients are soft. Finally, risotto with artichokes needs to be seasoned with grated cheese and garnish with parsley leaves. First of all, clean and wash the artichokes, peel the potatoes and cut into cubes. In a saucepan melt the butter and fry it in little onion and garlic. Then add the previously washed and chopped vegetables, season with Vegeta and add one litre of water. Cook on low heat for about half an hour, until the artichokes soften. After that, remove the vegetables from this water and chop it in a blender. Then return it to the pan and pour a little water if necessary. Add the cooking cream and lemon juice, if desired. Artichoke soup is ready when it becomes creamy, after which you can remove it from heat. For finer taste you will have to add the chopped almonds. These vegetables can be purchased in all markets and it is available and cheap. However, commonly used are the products of this plant. Therefore, if your choice is tea from artichokes price is around 4 dollars for a packing of 500 gr. The fact is that this vegetable has many advantages and benefits on our health. However, before its consummation, we recommend consulting with your doctor. The artichoke can cause side effects in people who are allergic to chamomile, ragweed, marigold and dandelion. If you belong to this group of people, there is a high probability that this plant will not be good for you. There are indications that it is not recommended for people who suffer from problems with the gallbladder, because it affects its work. In very rare cases, it can cause adverse reactions such as swelling, but it is a temporary phenomenon. We recommend artichoke tea to be drunk every day, in order to regulate and maintain body weight. Your body will be in the desired shape, and at the same time you will be saved from a number of diseases in a completely natural way!